If you're a die hard fan of The Walking Dead, especially its iconic villain Negan, you're going to want to start saving your money now. McFarlane Toys has another picture-perfect collectible ready to hit stores later this year. The toy company has partnered with AMC and The Walking Dead to bring Jeffrey Dean Morgan's Negan to life in a fully-detailed resin statue that is sure to send you on a one-way trip to Pee-Pee Pants City, real quick! The statue sees Negan, in Morgan's full likeness from the TV series, using his beloved bat Lucille to bash in the brains of an undead walker. While he's busy with that, two more walkers are crawling up his back, trying to get themselves a bite. You can check out a photo of the statue, as well as its full description from McFarlane Toys below! While the statue is incredibly detailed, and every Walking Dead fan would certainly love to get their hands on one, it's going to set you back quite a few bucks. The retail price for this epic Negan piece comes in at $329. Sure, it's a lot of money. But can you really put a price on your love for Negan? The new Negan statue will go on sale this October, around the same time that The Walking Dead Season 9 is set to premiere. 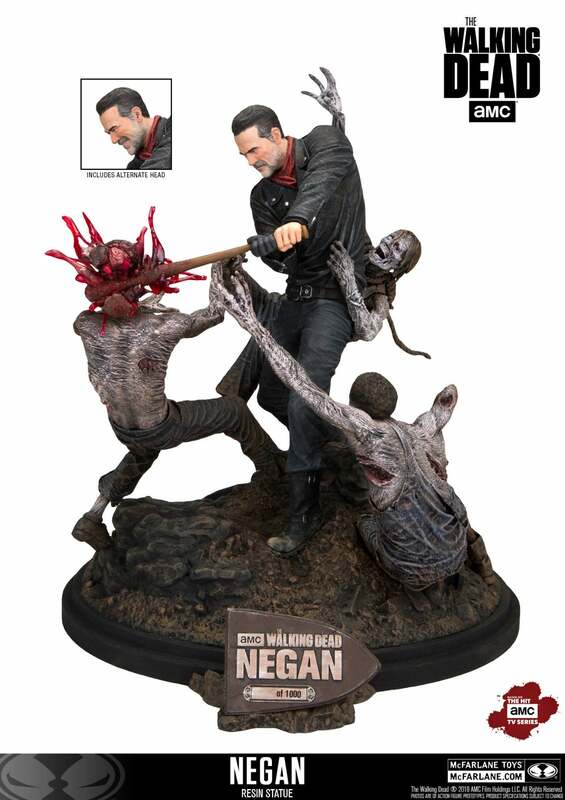 What do you think about McFarlane's newest Negan statue? Is it going to be a must-have for your collection? Let us know by dropping a comment below!